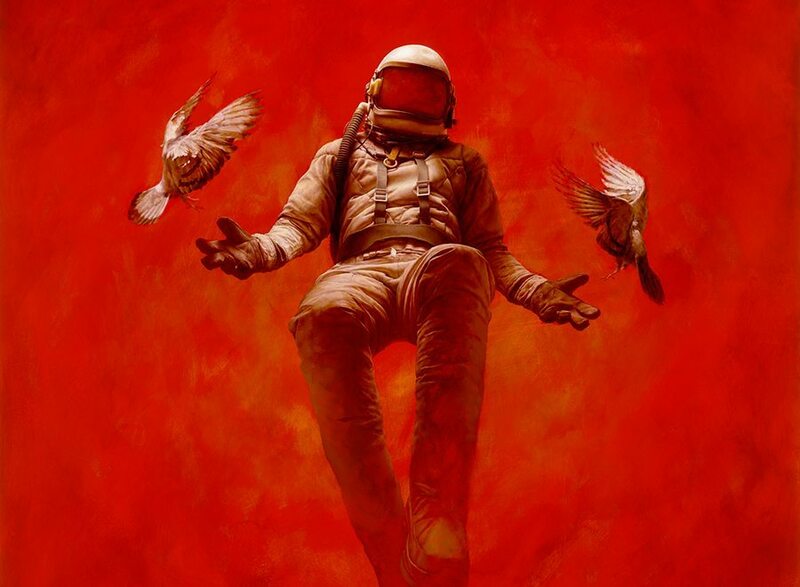 This piece, called Hypostasis, is part of Geddes’s cosmonaut series and was featured in the Juxtapoz anniversary show at the Jonathan Levine Gallery in NY. Geddes’s paintings are created with meticulous detail – the product of precise observation and exceptional brushwork – and often take months to complete. I think the most fascinating artistic elements of this piece are Geddes’s treatment of composition, tone, and color. The only subjects are a single cosmonaut and two pigeons, all in the center of an otherwise empty space. The painting is a moody red, a color that creates an atmosphere that is sensual and passionate, but also serious and enigmatic. 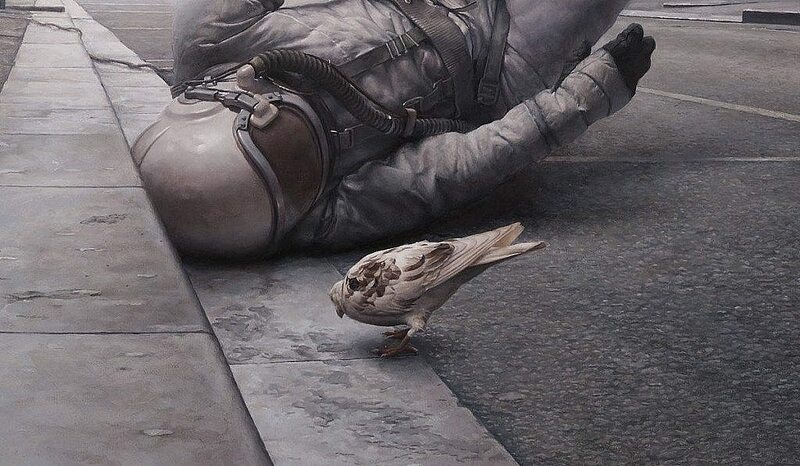 Geddes stated in an interview that through his works, he wants to “spark questions, rather than answer them.” Despite his photorealistic depiction of the subjects, this scene is evidently surreal, happening in some otherworldly place where pigeons can survive in outer space. There are little narrative elements or background features present, yet the subjects of Hypostasis are juxtaposed enough to suggest that a narrative is necessary. Through this, Geddes invites the curiosity of viewers. The cosmonaut seems lost in the undefined space surrounding him, wearing a helmet that conceals his identity and expression. Who is he, why is he here, and what is his relation to the pigeons? Geddes also sparks questions of time and space – does this scene depict one single, fragile moment in time, or does it suggest infinity and boundlessness? 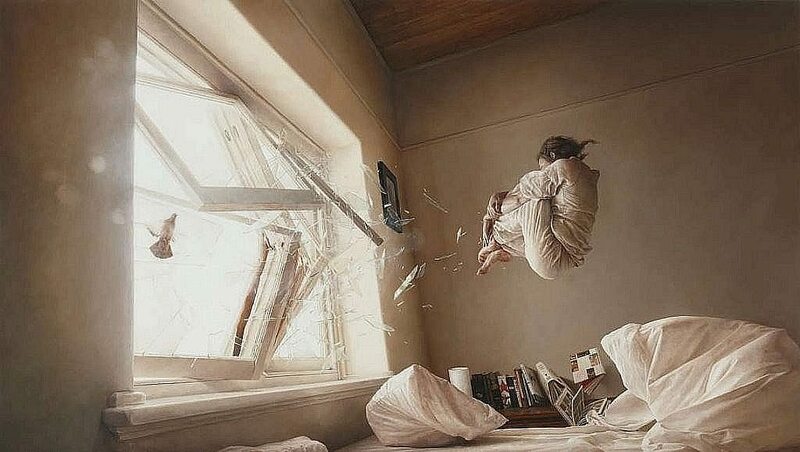 And is the cosmonaut suspended in space or falling through it? What do you think about this piece? Very thought-provoking, exhilarating pieces! Feels like stills form sci-fi movies! This invites a lot of thought on flight, flotation, motion, direction. Makes me think about the early Cold War space race and subsequent discussions on human race. Beautiful contrast on this piece! The angelic wings of the pigeons against a hellish red backdrop, with a symbol of humanity and science in the middle–absolutely stunning! These works are all so dreamy and powerful to me. I think they’re all tied by the underlying theme of zero-gravity and weightlessness. Breath-taking. The whole scene depicts the mere existence of environment for non human species where humans struggle to survive. It’s may be the Earth in the future.